Auroville is located on the southeast coast of India in the state of Tamil Nadu, 100 miles south of Madras and just north of the city of Pondicherry. The Auroville site, previously eroded and barren, is a flat plateau 150 feet above sea level. There are about 80 different settlements spread out over 2,600 acres within a 20 square-mile circle. Auroville's population currently numbers more than 1000 people from 30 different countries. In the immediate vicinity are a dozen Tamil villages with a total population of 25,000. The climate of Auroville is sub-tropical, with high humidity, and temperatures reaching 40C/105F in May and June. The main rainy season is from October to December, with an average yearly rainfall of about 135cm/53in. 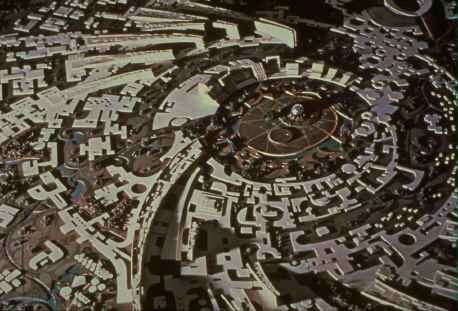 An early conceptual model of Auroville's city area. Here's a map of Auroville (96 Kbytes) in Adobe PDF format. You might first need to get the free Acrobat Reader from Adobe Systems. You might also need to configure your Web browser's helper application list for .PDF files.